To Cite: Sabouri S, Hosseini A, Shivaei S S. Retro-Aortic Inverted Left Renal Vein: A Rare Anomaly Found in a Renal Donor, Iran J Radiol. 2015 ; 12(2):e11374. doi: 10.5812/iranjradiol.11374. Awareness of the renal vascular anatomy including variants of the renal vein is important for abdominal and renal surgeries, such as renal transplantation. The complex embryological development of the renal vein results in the following variations: additional renal veins on the left side, circum-aortic renal collar and retro-aortic renal veins. 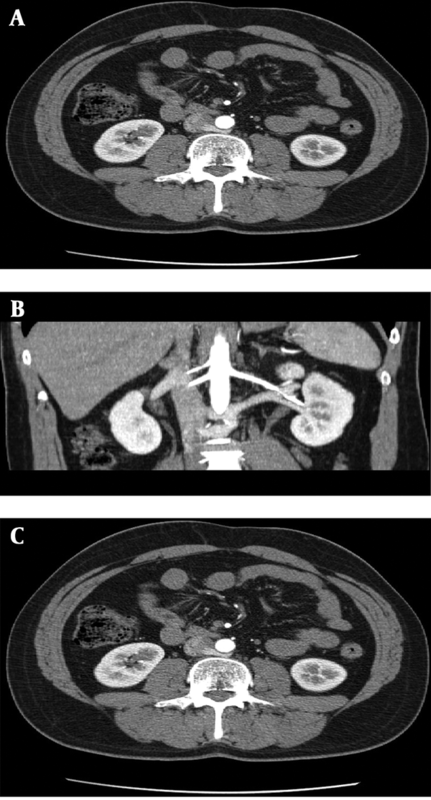 In this report, we present a case of a 35-year-old renal donor who had a rare renal vein anomaly that had been shown by computed tomography (CT) angiography. The left renal vein was single, and just before draining into the inferior vena cava (IVC) made two branches craniocaudally, which both passed posteriorly to the aorta and entered separately into the IVC. Complete knowledge of the anatomy and variations of renal veins is necessary for retro-peritoneal surgeries, including renal transplantation. Failure to diagnose these anomalies at surgery may lead to bleeding, nephrectomy and even death (1-3). Furthermore, hematuria, proteinuria or varicocele may be caused by left renal vein (LRV) anomalies, which are usually detected incidentally (3). These variations are more frequently detected and better assessed with the advent of multidetector computed tomography (CT) (4). 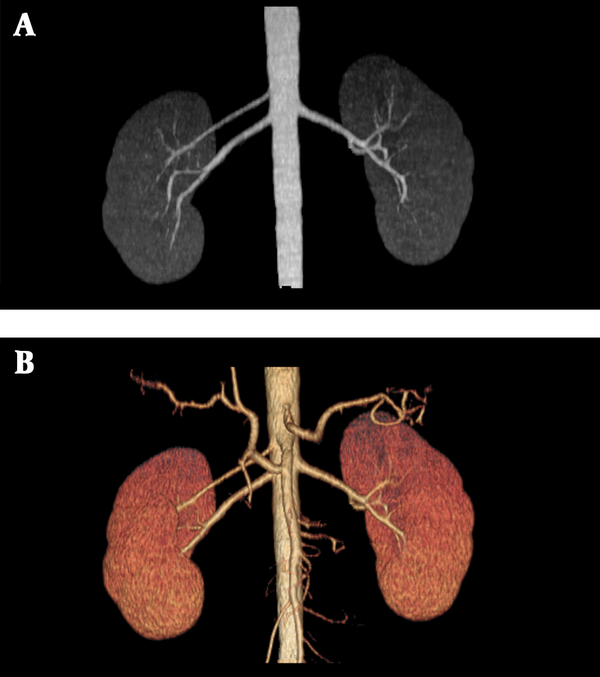 Computed tomography angiography (CTA) has been accepted as a reliable method for assessment of renal donors (5). LRV anomaly is more common than that of right side (6). There are few reports of rare cases of renal vein anomalies. Yesildag et al. reported LRV anomaly in 32 out of 984 cases (3.2%) in their study. Twenty-three (2.3%) of the cases were retro-aortic and 9 (0.9%) were circum-aortic LRV (2). Other variations in LRV are also reported (7-10). In this case report, we introduce a case with uncommon form of LRV drainage to the inferior vena cava (IVC). The patient was a 35-year-old man who was a renal donor. Routine ultrasonography of kidneys was normal. He was scheduled for abdominal CTA to define any preoperative vascular anomalies. Computed tomography angiography (CTA) was done with a 4-multidetector row CT scanner (light-speed QXi, GE Healthcare, Milwaukee, USA). Protocol of scan included 1.25 mm collimation, 7.5mm table speed and 1.5 pitch. Afterwards, One hundred milliliter of visipaque (300 mg/mL) was injected by a power injector. The scan was performed from diaphragm down to the level of pubic symphysis. To achieve optimal opacification of renal vein in addition to renal artery in renal donors, we use bolus tracking method, in which we start scan in the late arterial phase. Data were analyzed and processed on a workstation (ADW 4.1; GE medical system). Images were reviewed by the multiplanar reconstructions, maximum intensity projection and volume rendering options. Duplicated renal artery was observed on right side. The accessory renal artery originated from abdominal aorta adjacent to superior mesenteric artery, and both renal arteries had normal diameter and density (Figure 1A and B). The LRV was single, and just before draining into IVC, made two branches craniocaudally, which both passed posteriorly to the aorta and each one had a separate drainage to IVC (Figure 2A, B and C). Right renal vein and its drainage into IVC were normal (Figure 3). In renal transplantation, the morphology of the renal veins has a special importance in that variations may affect the method of the surgery. For example, variations limit availability of vein for mobilization methods. During surgery, the surgeon may see a pre-aortic vein while being unaware of an additional retro-aortic portion or a posterior primary branch, and may disturb it while mobilizing the kidney (1-3). Thus, imaging screening of potential renal transplantation donors seems to be critical. 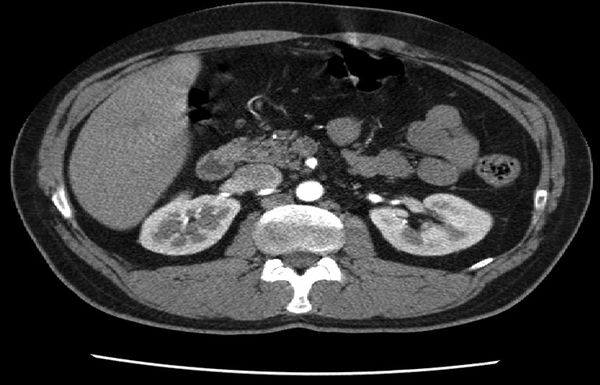 These variations are more frequently detected and better assessed with the advent of multidetector CT. Computed tomography angiography (CTA) is a noninvasive accurate method to evaluate renal donor (5), even though venous anomalies can be distinguished in routine abdominal CT scan with a careful review (2). During fetal development, there are 3 major types of renal vein (I, II, III) based on the drainage pattern of the primary renal vein tributaries. The most common type is type 1A, which has two upper and lower primary tributaries that combine together to make the main renal vein. The second most common is type 1B with upper, lower and posterior tributaries. Type 3 has the additional renal vein too (11). Classically, there are variations of the LRV configuration: a single-renal vein crossing in front of the aorta to drain into the IVC (normal), retro-aortic LRV, duplication of the IVC or transposition of the IVC and circum-aortic LRV (2, 3, 8). There are few reports of rare cases of renal vein anomalies. Brancatelli et al. reported a 27-year-old man evaluated with a 1-year history of recurrent right flank pain, hematuria, fever and dysuria. Images showed a retro-aortic (LRV) attaching the left common iliac vein (7). Turgut et al. reported a retro-aortic (LRV) attaching the left common iliac vein (8). There is also a variant of the retro-aortic LRV category with a possible low implantation to the IVC at the L4-L5 level, which has been described by Hoeltl and colleagues (9). Two cases, one with two LRV’s draining in two different sites of the IVC and one with orthotropic IVC and ectopic left common iliac vein represent a combination of the normal LRV attitude and low-positioned variant of the retro-aortic LRV. An additional renal vein is an accessory vein with a separate origin from renal hilum and a draining site into IVC, which has been found in more common cases (10). In our case, the (LRV) was single and just before draining into IVC made two branches craniocaudally, which both passed retro-aorticly and each one had a separate drainage to IVC. Since we could not find a similar case, our case should be the first reported one with this anomaly. We would like to thank the Radiology Department of Shahid Beheshti University of Medical Sciences, Tooska Medical Imaging staffs and the head of the department. Authors’ Contributions: Dr. Sabouri developed the original idea and the protocol, abstracted and analyzed data,assessed the images, wrote the manuscript, and is a guarantor. Ashraf Sadat Hosseini and Seyedeh Shirin Shivaei contributed to the development of the protocol, abstracted data, and prepared the manuscript. Funding/Support: All the procedures and steps of this study were done with the financial support of Radiology Department of Shahid Beheshti University of Medical Sciences.